Sotirianika is the Municipal compartment at Avia Municipality and belongs to the alpine region. It is built on the foothills of Taygetus. It has dense vegetation and exquisite beauty. 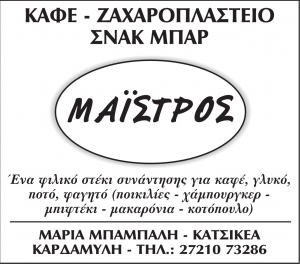 However, it is out of the central roads, so if someone wants to go there, he has to take the junction at the 12th km on the country road Kalamata-Areopoli. Village Haravgi (Trikotsova) belongs to the Compartment. There are 293 inhabitants (census 1991) who occupy themselves with olive growing and cattle breeding (3 flocks with sheep and goats). The family income is increased by cattle breeding and orchards. The village is very old since at the area “Hrysa” they have found Mycenaean findings of great historical value, which have been unfortunately depredated and there is nothing else known about these until today. Within a short distance, there is Marvinitsa, which is an old town, according to tradition, which used to have 3-4.000 inhabitants. Today only the ruins of some churches are preserved and that of Agios Nicolaos. The big summer feast on Agios Panteleimonas Day takes place in this area. Water tanks, a tiled ditch and the remains of an old olive mill complete the image of the surrounding area, which is protected by the Ministry of Culture. We shouldn’t omit to mention the stone lane that starts from Exohori, through Kentro and Sotirianika up to Kalamata. It is in a very good condition, whereas with some improvements it will become a significant monument of art and culture. A little further down, the church of Agia kyriaki was erected at the first years of Christianity in Mani. It is preserved and renovated according to the characteristics of that era. Zoodohos Pigi church at the centre of the village was renovated recently. At the churchyard, there is the cemetery, which will be transferred to a different place. 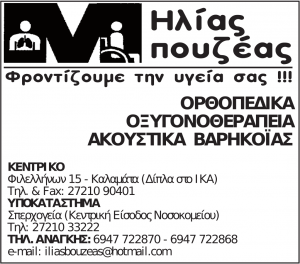 Transportation to and from Kalamata is done by KTEΛ buses. The country roads cover the 90% of the cultivated areas and are rather satisfactory. A big part is asphalted as, due to the steep incline of the ground, the rains have caused corrosions. The area is watered by the springs at MC Kentro and in summer there is extra water coming from MC Altomira in order to cover the increased needs. The Cooperative factory produces olive oil and consists of 100-110 farmers. It is a viable and profitable business. 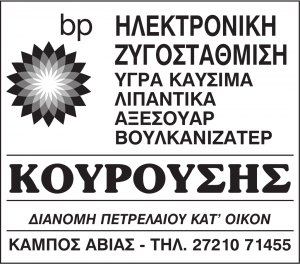 Georgios Kouris, who is a retired teacher and ex president (1990-1994), is very active regarding the social issues of the village. He has important experience in issues of the local self-government and finds and promotes solutions for everyday life. We would like to thank him for the tour to the Municipal Compartment of Sotirianika.